A common receptor placement error is inadequate coverage of the area to be examined radiographically. This typically occurs in molar projections when the patient has difficulty maintaining proper receptor placement. Each periapical and bitewing in a complete survey has established criteria which describes the structures of interest that should be recorded on each view. Consistent application of these criteria will minimize this error. Missing apices can be caused by a receptor placement error. When using receptor holders, the biteblock should be placed on the teeth to be exposed and not on the opposing teeth. If the biteblock is placed on the opposing teeth and the patient is required to bite the receptor into place, a placement error is likely to result. Placing the receptor more lingual to the teeth where the palate and floor are deeper will make placement easier and more comfortable for the patient. Placement of the biteblock and receptor in the correct position first and then having the patient slowing bite to maintain the placement is the preferred and most effective approach. Placing the film backwards in the mouth causes the lead foil inside the packet to face the radiation source instead of the film. The x-ray beam is attenuated by the lead foil before striking the film. This causes the embossed pattern on the foil, a herringbone or diamond effect, to appear on the processed film. This error also results in a lighter image and confusion about the correct anatomical area recorded when mounting the processed film. This error is also possible with phosphor plate receptors. In either instance, attention to the orientation of the receptor inside the mouth is critical for diagnostic results and avoidance of diagnostic errors. Backwards placement is less likely with rigid digital receptors because of the wire attachment on the non-exposure side of the sensor. The exposure side of any receptor must be directed toward the x-ray source to produce an acceptable image. Plate or film bending may occur due to contact with the curvature of the palate or lingual arch and/or mishandling of receptors. These receptors can be flexed but should never be bent. If the receptor is too large for the area, bending can also occur. Select a receptor size that will adequately cover the area without producing excessive discomfort to the patient. Crimping, creasing or folding a plate or film receptor damages the emulsion and compromises the quality of the image. Careful handling, use of a smaller receptor, and correct placement will address the problems of bending and image artifacts. Rigid digital receptors cannot be bent but as previously indicated phosphor plate receptors can be creased, bent, scratched or folded. These alterations result in permanent damage of the plate and produce artifacts on the current and any subsequent image. Damaged plates should be replaced when the artifacts interfere with the production of diagnostic images. Tissue cushions are better alternatives than bending or creasing a plate or film receptor. When the receptor is not placed perpendicular to the occlusal plane, the occlusal plane will appear slanted or diagonal. When exposing bitewing radiographs, the top edge of the receptor may come in contact with the palatal gingiva or curvature of the palate. When this occurs, the occlusal plane will appear crooked. The receptor must be placed straight or perpendicular with the occlusal plane, or placed farther away from the teeth to avoid this error. Always place the biteblock in contact with the occlusal or incisal surfaces of the teeth you are imaging not on the opposing teeth. Placement on the opposing teeth will cause the receptor to displace when it contacts bony anatomy. Preferably, the receptor orientation dot should be placed toward the crowns of the teeth for periapical images and toward the mandible for bitewing images to reduce interference with viewing structures of interest on the recorded image. When using the paralleling technique and receptor holders, the vertical angulation is dictated by the holding device to enable the x-ray beam to be perpendicular to both the receptor and teeth. Therefore, it is important that the clinician place the receptor parallel to the teeth to ensure proper vertical angulation. In contrast, when using the bisecting angle technique, the beam is perpendicular to the plane that bisects or divides the angle formed by the teeth and the receptor. It is important to determine the cause of the error. Elongation or lengthening of the teeth and surrounding structures results from underangulation of the x-ray beam. When elongation occurs using the paralleling technique, the angulation of the x-ray beam is less than the long axis plane of the teeth. To correct this error the operator must increase the vertical angulation. In other words, for the maxillary arch, the positive angulation must be increased (PID pointing down); for the mandibular arch, the negative angulation must be increased (PID pointing up). This error can also occur when using the bisecting angle technique. Often the error is caused by the x-ray beam being perpendicular to the long axis of the teeth, rather than bisecting the angle between the teeth and the receptor. Foreshortening or shortening of the teeth and surrounding structures can also result from improper vertical angulation. Foreshortening is the result of overangulation of the x-ray beam. When foreshortening occurs when using the paralleling technique, the angulation of the x-ray beam is greater than the long axis plane of the teeth. To correct foreshortening when using the paralleling technique, the operator should decrease the positive vertical angulation for maxillary projections, and decrease the negative vertical for mandibular projections. 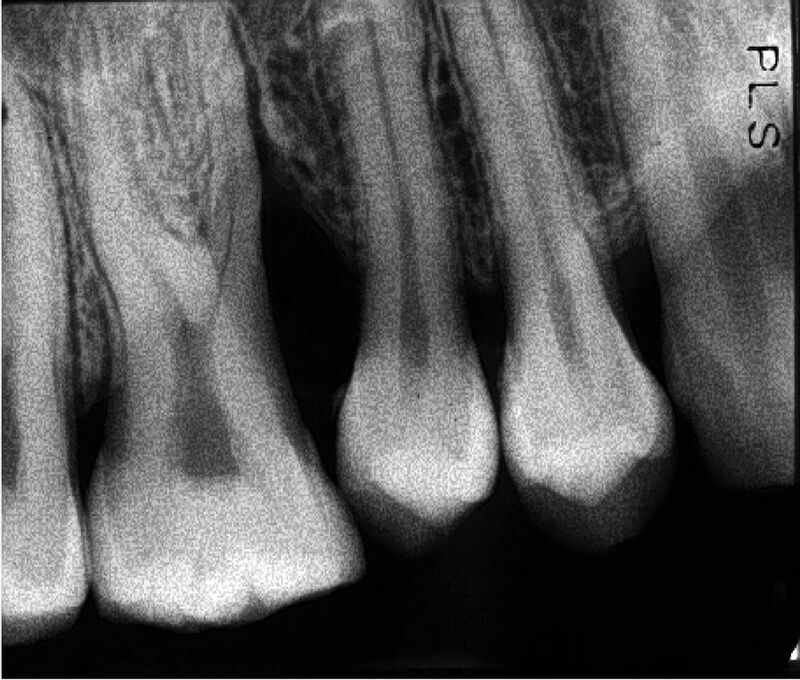 This error can also occur if the receptor is not placed parallel to the long axis of the teeth. Proper horizontal alignment of the x-ray beam will open interproximal contacts and facilitate a thorough caries evaluation and assessment of bone levels, which are all components of a thorough clinical and radiographic examination. The x-ray beam should be aimed directly between the targeted teeth in order to open interproximal surfaces. Horizontal alignment errors cause the image to shift anteriorly or posteriorly, resulting in the overlapping of the interproximal surfaces. To determine if the horizontal angulation is positioned incorrectly, evaluate the extent of the overlap. The Buccal Object Rule can be used to determine the movement buccal and lingual cusps when trying to define the error. The Buccal Object Rule states: Buccal objects move in the opposite direction compared to the direction of the x-ray tubehead while lingual objects move in the same direction as the movement of the x-ray tubehead.12 Application of the Buccal Object Rule to determine the cause of interproximal overlapping requires evaluation of the position of the x-ray tubehead and the direction of the overlapping on the bitewing image. For example, if the x-ray head is placed too posterior in position, the buccal cusps will overlap in an anterior direction as demonstrated in the molar bitewing image illustration. By way of comparison, if the x-ray head is placed too anterior in position, the buccal cusps with overlap in a posterior direction. To avoid this error, the central ray must pass through the teeth where the contacts need to be open. When using receptor holding devices, horizontal errors can occur by improper horizontal alignment of the receptor. These errors can be avoided by placing the receptor relationship in alignment with the teeth so that the x-ray beam travels directly through the contact areas. This will place the receptor parallel to the buccal plane of the teeth of interest as well as the parallel to the instrument indicator ring. The central ray should be aligned over the center of the receptor with the x-ray beam directed perpendicular to the receptor. When this alignment is not observed, a cone-cut occurs. Cone-cuts appear as a clear zone on traditional radiographs after processing, due to the lack of x-ray exposure in the area of the cut. When using digital imaging, the cone-cut appears as an opaque or white area. The shape of the cone-cut depends on the type of collimator used when exposing the receptor. For example, if a round collimator is used, a curved cone-cut will appear. Square cone-cuts occur when using a rectangular collimator. To correct a cone-cut error, the beam should be re-centered toward the area of non-exposure. Improper assembly of receptor holding devices can also cause cone-cuts. When assembling these devices, make certain that the entire receptor can be seen while looking through the indicator ring.